The UV Pro Elite Base is a fast charging docking station that houses a maximum of four individual UV light sanitizers at a time. You can place the individual UV sanitizers into the base and plug the unit into a wall outlet for easy charging. With safety in mind, the base has a protective wall to protect the sanitizer from accidental damage while charging. This is a great addition to your individual UV sanitizers and a convenient way to keep them all charged simultaneously for the next item to be cleaned. The UV Pro Elite Base is a fast charging docking station that houses a maximum of four individual UV light sanitizers at a time. The UV Pro Elite Base is designed with four custom slots so you can easily insert each individual UV sanitizer and plug it in using an adapter into an outlet for easy charging. The Base also comes with two holes in the back so you can hang it on the wall near an outlet to save space and avoid clutter. With safety in mind, the base has a protective wall near the top to protect the sanitizer from accidental damage while charging. This lightweight base can be placed vertically on its base or placed on its’ back while charging, the units will stay put in any position. This is a great addition to your individual UV sanitizers and a convenient way to keep them all charged simultaneously for the next item to be cleaned. 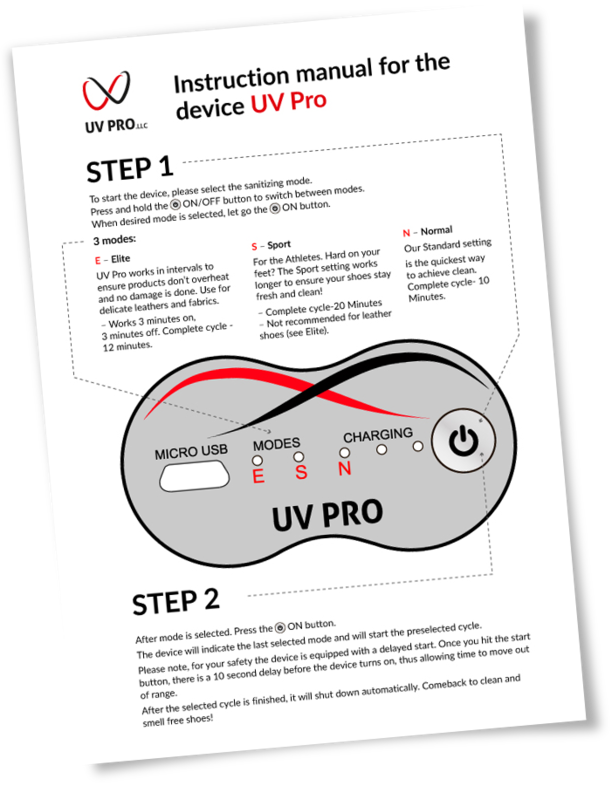 UV Pro Elite Base is the convenient way to charge wireless, versatile and rechargeable sanitizer device that uses UV light to sanitize and clean shoes, gloves, bags, and any other enclosable products in just minutes. According to the Mayo Clinic “Germs live everywhere. You can find germs (microbes) in the air; on food, plants, and animals; in soil and water — on just about every other surface, including your body.” It’s no wonder that our clothes, shoes, homes, cars and other possessions can easily be transport vehicles for potentially harmful germs and bacteria. Protect yourself and your loved ones with a simple investment to sanitize and clean items that could be havens for these unwanted germs and bacteria. So far, we have only tested UV Pro elite for the last few days. It’s performing well for the stuff we’ve used it for. We plan a trip and we’ll know more about it then. I hope this helps. I bought this sanitizer to replace my previous onecause it has more options: all in one. It is surely a better product in all respects than what I owned before. I would recommend this product to first time buyers who are looking for long term usefulness. There are several things to note that I liked in this particular product is that you can charge it and take it anywhere and the design is small enough to put it in your purse. The foot has a complex and vital role in human anatomy. We’re equipped with 10 toes, 250,000 sweet glands, 42 muscles, 26 bones, 33 joints, and more than 100 muscles, tendons & ligaments. In addition to its weight bearing role, the feet can adversely affect your health when they are not carefully protected. With so much at stake with your feet, it’s no wonder that UV Pro® Elite is considered the perfect insurance for your feet. 5% of the population suffers from nail fungus. Most turn to topical ointments, drugs or expensive laser treatments to get rid of the problem. However, many people do not realize that the dark, damp environment inside shoes is a leading cause to the problem and often times cause reinfection. Cut down on cost and chemicals, and go straight to the root of the problem. UV Pro provides a safe, eco-friendly solution to treating and preventing nail fungus. People who suffer from diabetes also suffer from a diminished immune system and are more prone to health problems. The American Diabetes Association instructs people with diabetes to do a body scan daily. The reason? Once an infection develops, they have a harder time healing and what starts as a small infection can easily result in more serious complications. Use UV Pro to kill the germs and bacteria in shoes, gloves, and other products before infections develop. Preventing the problem before it catches foot! 1 in every 25 patients suffers from a healthcare-associated infection. HAIs are infections that people acquire while receiving treatment for another condition in a healthcare setting. HAIs costs the US healthcare system billions of dollars of year, and often leads to other complications in a patient’s treatment, including fatality. HAIs consists of bacteria, fungi and viruses not seen to the eye and difficult to clean. proven to kill and eliminate 99.99% of all pathogens. Did you know that your feet and hands have the most sweat glands than any other part of your body? Now think about how often you wash your shoes or gloves? What about your gym bag? While the sweat itself doesn’t smell, shoes, socks, gloves and bags can trap odor-causing bacteria, which thrive in dark, damp environments. Just like you wouldn’t re-wear an outfit multiple days without washing it, take care of your shoes, bags, gloves and other day-to-day items! UV Pro is guaranteed to sanitize and kill up to 99.99% of odor causing bacteria. UV Pro uses UV light to sanitize and clean the hard-to-reach areas of any product. When it comes to UV light wavelength there are three categories; UV-A, UV-B and UV-C.
UV-C is the shortest wavelength of ultraviolet radiation, which kills microorganisms. It works to break apart germ DNA and destroys bacteria, viruses, molds and other pathogens. With broken germ DNA, the microorganisms can’t function or reproduce. This is not a new practice but dates back to the mid-20th century where it was used in medical sanitation. It then became a way to purify drinking and wastewater, and now more recently can be used to clean anything from your cell phone to the air you breathe. Unlike others, our device is equipped with a UV-C lamp that also produces ozone. While the UV light might not shine on all hard-to-reach areas, the ozone will, ensuring 99.99% of germs are killed. This technology has proven to be the most effective on the market today. What about charging the device? The UV Pro® shoe sanitizer gives you great flexibility in charging the device because of its wireless design. You have the option of using the charging dock or any USB connector port to charge the device. No need to worry about being close to a power source when you need to use the product. Just charge it in advance and take it anywhere you need to go. Can I use the product if I am diabetic? Yes. People diagnosed with diabetes can use the shoe sanitizer. Oftentimes, people with diabetes suffer from foot diseases and the shoe sanitizer will kill 99.99% of germs, fungi and pathogens which pose a greater risk to those with diabetes.If you are a diabetic, then you are prone to infections that originate from fungus. These germs find a habitable environment in shoes and other items like gloves and bags. Prevention is the best protection you can buy. Will the UVPro® Shoe sanitizer work on different sizes of shoes? 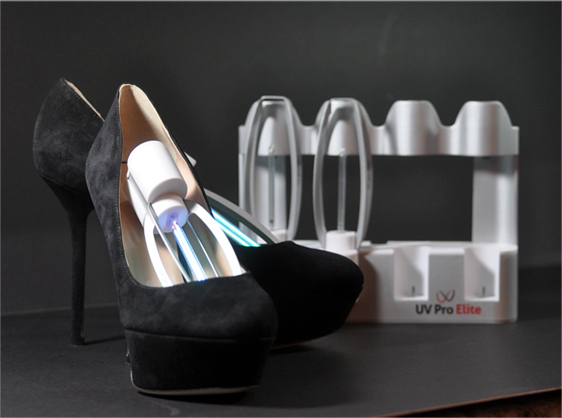 Yes the UV Pro® shoe sanitizer will work equally well on any size of shoe. It is a one size fits all insert that would work on any shoe larger than a baby sized shoe.